10/21/06: Gaeta comes under scrutiny by the Circle, but he apparently survives based on previews that have shown him in a cell with Baltar. Tigh, Kara, Seelix and two new characters: Barolay and Conner. 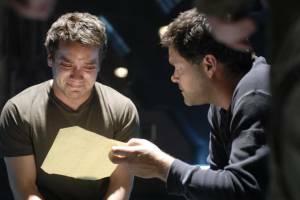 10/7/06: Looks like Baltar makes is back to fleet...and then ends up on a Basestar when the Cylons kidnap him. Looks like Tyrol is confronting Jammer with evidence of his collaboration. 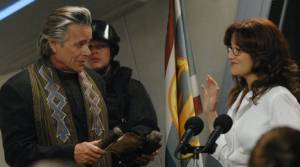 Roslin sits behind the President's desk with Adama and Tigh by her side. Baltar is being confronted and has his Inner Six along. Roslin takes the oath of office as President. Looks like Caprica Three is greeting Baltar somewhere. 10/3/06: Kara "bottoms out" and then shows her "rededication" by cutting her hair. 9/27/06: Preliminary Episode Synopsis: The Cylon collaborators are dealt with. Meanwhile, Baltar is onbaord a basestar.